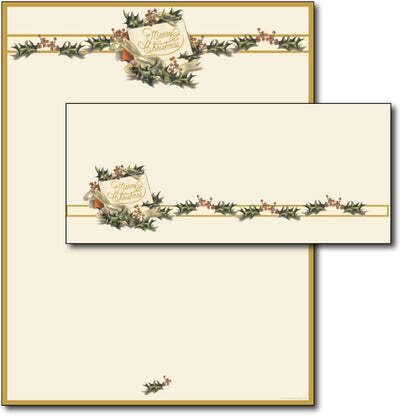 Vintage Christmas Holly Stationery & Envelopes capture the joy of the holiday season with a subtle border and beautiful row of holly across the top. The lightly colored center is also perfect for creating messages. Use this vintage Christmas paper to send your Christmas letters or holiday invites! These Vintage Christmas Holly Letterhead & Envelopes are made from a 50lb Text paper stock, while being both inkjet & laser printer compatible. Each stationery sheet measures 8 1/2" x 11". The accompanying envelopes are the standard #10 size of 4 1/8" x 9 1/2" and are gummed for easy sealing.